For many years, Ladysmith rock band Skellig has emphasized giving back to the community, raising money for the Ladysmith Food Bank in many ways. And now, that community support is an even bigger focus after the band signed with Mighty Speck Records (MSR), a new Victoria-based record label run by James Kasper, founder of the Vancouver Island Music Awards. The label focuses on positive contributions to the local and global community, and each label artist supports a charity of their choice. As well, MSR focuses on youth mentoring, artist development and accessibility for artists. Skellig, a rock band influenced by Irish folk, world and rock music features Chris, Lisa and Caleb Burness, Mike O'Shaughnessy and his son Will, and Dylan Wickham. The band was a Canadian National Finalist in Hard Rock Rising 2012 and was nominated for Live Act of the Year at the 2013 Vancouver Island Music Awards. Signing with MSR was a great fit for the band, according to Lisa Burness. "From Skelligʼs perspective it is an opportunity to join with other artists to achieve more as a group," she said. As far as supporting a charity goes, Skelligʼs main focus is the Ladysmith Food Bank and soup kitchen. Each Christmas, Skellig instigates the Celebration of Light fundraiser event with the Rock Christian Fellowship to raise money for the Ladysmith Food Bank. The soup kitchen is a new program that is providing a hot meal and community to people who are not always able to provide that for themselves, explained Burness. "As always, the Ladysmith Eagles, local churches and a whole host of fabulous volunteers give up their time to enable this to happen," she said. "It seems that the least we can do is try and raise funds for these programs, as we all work full-time and can't volunteer. As such, we have always donated 10 per cent of every gig that we do all year to help with various programs. From this point on, this specific focus will be the soup kitchen program and Food Bank." Skellig is raising money for the Food Bank this summer during the first MSR tour, which takes nine roster artists to 10 BC cities, showcasing a diverse mix of genres at 15 shows over seven weeks. Skellig performed its first MSR showcase at the tour kick-off show July 4 in Courtenay. "It was really fantastic from the perspective that everybody took something along," said Burness. "Everyone was really supportive of everyone and encouraging of the different genres we were playing. It was really amazing to be part of a group effort like that where everyone put their best foot forward." Burness says it's also a great way to make connections with people who are doing the same things they are in different parts of BC. "It's nice to have a different audience listening to you in places we've never played," she added. This weekend, Skellig will perform Saturday, Aug. 2 with MSR at Char's Landing in Port Alberni and Sunday, Aug. 3 at 5p.m. as part of Ladysmith Days. The MSR 2014 Summer Tour comes to Ladysmith Friday, Aug. 29 at In the Beantime Cafe and will likely include performances by Skellig, James Kasper (with cellist Larry Burke), Chris Andres, PeaK, and Jonny Miller. Skellig, seen here performing at the Celebration of Light in December, has made it to the next round of the Hard Rock Rising competition and will perform live in Toronto. Ladysmith Celtic rock band Skellig will soon be playing a live battle of the bands in Toronto. Early last week, the members of Skellig found out they made the top nine in online voting in the first phase of the Hard Rock Rising competition, earning a chance to play live at the Hard Rock Café in Toronto. Electric violin/guitar player Lisa Burness says they are thrilled with the outpouring of support they received during the contest. Skellig finished about third out of 300 to 400 bands in the first round of competition with about 400 votes. 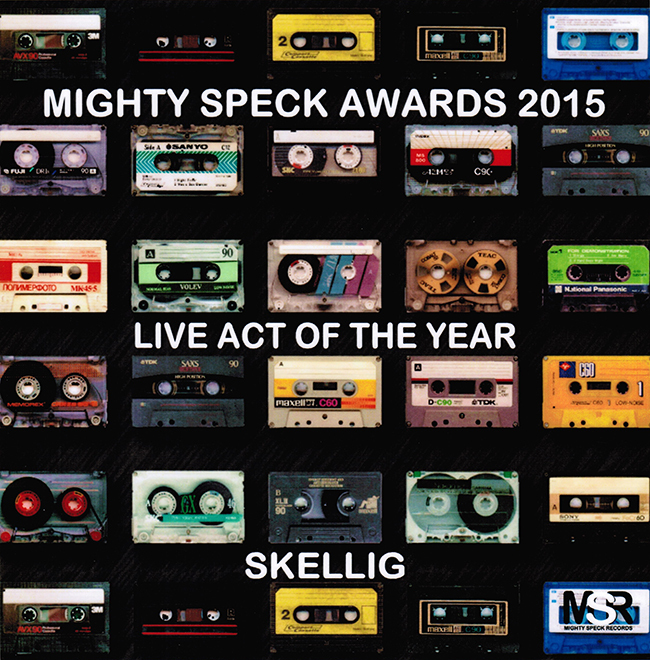 Skellig will now play a live battle of the bands in Toronto on March 1. Skellig will compete against three other bands, and if they win, they’ll play in the final on March 8. The winner from across Canada will enter the third round, a global competition, which will include another round of online voting. The winner of the global competition will play Hard Rock Calling in London, explained bassist Mike O’Shaughnessy. To help the band get to Toronto, Skellig has opened an account at the Ladysmith and District Credit Union for anyone who is willing to support them in their travels. The account is in the name Skellig. O’Shaughnessy says the online contest was a bit of a roller coaster. For much of the competition, Skellig was a solid second place in online voting. For the competition, people could download the band’s song Kingdom Come, and that counted as a vote. Burness wrote the song, which is the title track of the band’s latest album, with her husband Chris, the band’s lead vocalist. Begun by Chris and Lisa Burness, Skellig played extensively in the U.K. A move to Vancouver Island in 2006 meant the creation of a new lineup, including Mike O’Shaughnessy, followed by his son Will. Most recently, Dylan Wickham and Shelley Brown have joined the band. This lineup recorded Skellig’s latest CD, Kingdom Come. The album is available now, and the band will celebrate the new release at two open mics in March. Skellig’s first CD release will be during the first acoustic open mic March 3 at the Willow Street Café in Chemainus. Skellig is also starting an electric open mic at the Crofton Hotel and will celebrate the new CD March 24. Burness is very happy with the album. “I would say it’s the best thing musically we’ve done,” she said. Kingdom Come was recorded by Will O’Shaughnessy in the Burness’ basement, and it was mixed by Zak Cohen in Duncan and mastered by Brad Blackwood in Nashville. As a special treat for his popular open mic series, Larry Kossey of Chemainus's Dancing Bean has invited the lively group, Skellig, to host a songwriters night Saturday, Aug. 1. Starting around 7 p.m., with admission by donation, this event is surely the hottest open mic on the Island and with a hot summer night and Skellig at the helm, it'll be a sizzler. They rocked at the recently-completed Islands Folk Festival; here's your chance to hear them again in the intimate confines of the caf? on Willow Street. Get there early to get on the play list. Another chance to hear Skellig, this time with the tribute production, Live Rust, has been scheduled for Saturday, Aug. 8 at the Saltair Pub. Gates open at 5:30 p.m. and tickets are $25 each as Saltair City Limits presents an evening on the lawn of the pub, including a barbecue dinner and live music. With incredible attention to every detail, Live Rust has worked extremely hard to bring the full concert experience of Neil Young to every show. Live Rust is a real Valley favourite and Neil Young fans and classic rock & roll fans in general are in for a great night. Fifteen kilometers off the coast of County Kerry Ireland rises a rocky island that was home to Irish Celtic monks for six hundred years. Remote, spartan and yet inspirational ‘Sceilig Mhichíl’ (Michael’s Rock in old Irish) it is now a world heritage site that among many other points of interest and honour. It also gave rise to the name of the Chemainus Valley’s own British invasion, the Celtic rock band Skellig. Lisa and Chris Burness visited Vancouver over four years ago. With twelve years of music touring the UK and two albums under their belt they felt it was time to make a move. Despite never having set foot on Vancouver Island at that point, they decided it would be their home. They left their Dorset, England home - where Lisa’s father often recited the ditty ”I be Dorset born and bred, strong in the arm and weak in the ‘ead’ - for the welcoming shores of the Vancouver Island because “..It just felt like home.” It was left up to their son Caleb to pick the spot to settle and after a trip up and down the Island, Caleb chose Ladysmith. It has been their home since. Steve Nash (lead guitar) was there with them at their first show, the Ringwood Festival, held in a car park in 1983. A childhood friend and long time collaborator Steve followed shortly thereafter. When asked by immigration why he wanted to come to Canada he replied ‘well all my friends are going, I’m sure I will like it.” And like it he does, citing the sheer natural beauty and reiterating the sentiments of Chris and Lisa, “it justs feels like home, like I belong here.” And oddly enough none of them have ever admitted to any feelings of homesickness. Chemainus is now Steve’s chosen home. I am sure that there are many of us transplanted Islanders that can sympathize. Check out the song ‘Home’ by the Comox Valley’s Todd Butler for a beautiful sonic sample of those feelings. They are joined in their performances now by Nanaimo’s father and son team of Mike (bass guitar) and Will (keyboards, mandolin, guitar) O’Shaughnessy. If this is sounding more and more like its about family maybe that’s because it is. Collectively they cite many influences not commonly associated. The traditional Irish Folk music alongside African rhythms and the modern beat of bands like U2, Led Zeppelin and Pink Floyd and even the Masters like Mozart, Tchaikovsky andRachmaninoff. And then there is Caleb on percussion who now at the ripe age of fifteen names Led Zeppelin’s John Bonham as his favourite drummer. I am not sure how he knows about those old rockers but I did learn that Chris and Lisa had very hard time keeping drummers in their early years. They solved that problem by conceiving one of their own. Handy job, handy too that Caleb will work for food, “….preferably cheesecake”. A welcome invasion indeed! Skellig can be heard locally at the Chemainus Arts and Cultural Festival Saturday April 25. This summer they are booked to play Ladysmith Days and Island Folk Fest. They will also be celebrating the release of their new CD with a concert at the Dancing Bean Café Saturday May 9. Check them out at www.skellig.ca.